You know how Taylor said, "Pour yourself a drink, put on some lipstick and pull yourself together"? Yea, I am an ardent follower. Every time I feel low, I empty a bottle of vodka, put on the infamous MAC Russian Red and pull myself together over a dozen cigarettes. Okay so when it is upto drowning my sorrows, its usually over a huge cup of green tea, a lot of drool over Stefan Salvatore (I ain't a Damon fan yet, though I have a massive, massive crush on Ian) and nail paint. Yea, I paint my nails every other week because it makes me feel like a new person because the old one would have chipped making my fingers look ffffffugly. But this lil bottle of fun, here, this lil thing has made me very lazy. Why? Read on. 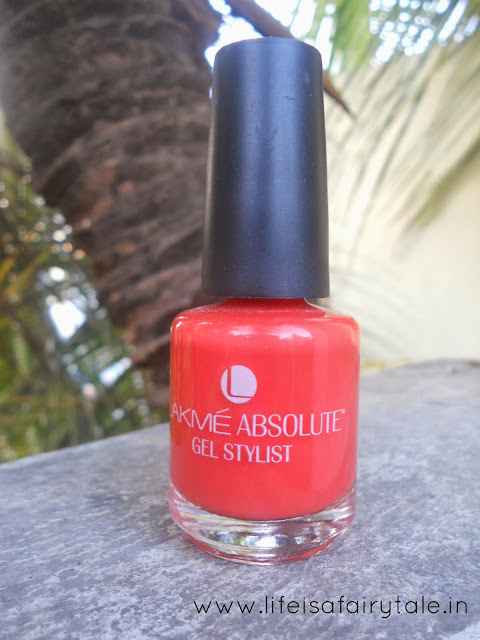 Okay so this nail paint,called Electric Orange is from the series of Gloss and Gel Stylist from Lakme Absolute. 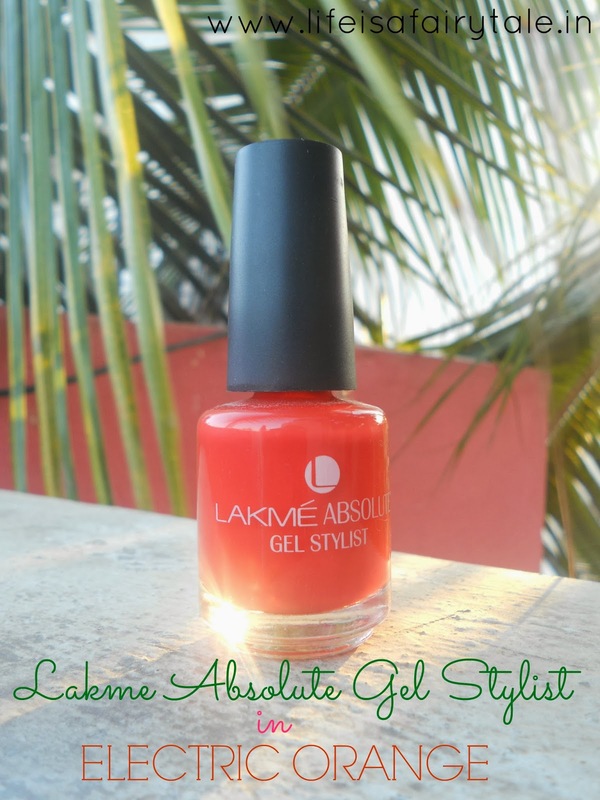 The nail paints claim to give a gel manicure - gel like finish, thick and opaque, in just one stroke. It costs Rs.400/- for 3.6 gm. The brush is HUGE. It colors half my nail in one go and picks up a LOT of color, so make sure you drop down the excess back to the GIGANTIC bottle. The paint in itself is thick but not goopy. Okay so the color stays for looooooong, like really looooooooooooooooooooooooooooooooongg! You see the swatch below? Its taken after two days after painting my nails. Still looks so new and fresh and rich. I prefer applying two coats cuz it gives a very nice and pretty finish. It dries quickly, but I suggest you wait till it dries for a longer time, or use a top coat or dip your fingers in cold water to seal the color cuz it sort of picks up patterns of things that might touch it - fabrics may be. 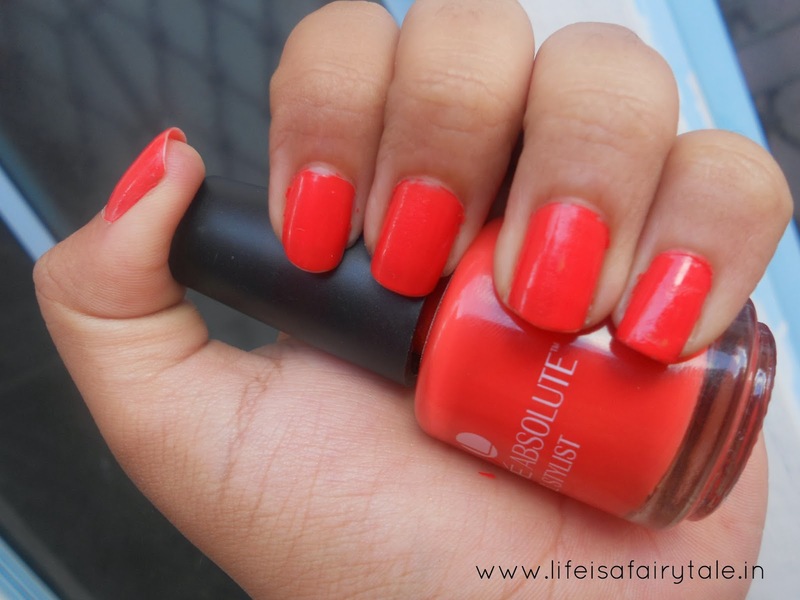 Rs.400/- is honestly too much for a nail polish, IMO. My heart rips apart when I am paying so much, so most times I prefer cheaper ones cuz hey! I have new color on my nails every week and I sort of prefer having a set of new colors every few months. Rs.400/- is definitely a whole in the pocket. Yea, if you want a quality nail paint that doesn't chip for a long time, and gives a fab finish. My only problem is the price. Rs.400/- is HOLY COW! THAT'S EXPENSIVE!! loved reading the review and it's a lovely shade. but Rs.400!! for this!!! it's crazy priced, Lakme!! !